I love Tex-Mex food, or at least the Mid-Atlantic approximation of real Tex-Mex that I get around here. Salsa, tacos, burritos, Chipotle... all of these things make me very, very happy. I've had the pleasure of visiting the great state of Texas twice and I can assure you that the highlight of my visit was the cuisine. While it's not always good for your waistline, Tex-Mex is really tasty and a welcome departure from the typical soups, salads, pastas and pizzas that we serve so much around this house. I've posted and tried a few enchilada recipes, including these delicious Pork Enchiladas. I like that you can stuff enchiladas with any meat (or even beans and veggies) and that you can go authentic and use corn tortillas or you can break all the rules and use flour tortillas. I recently tried a great recipe from (who else?) my BFF Pioneer Woman and it came out really well. She adds in some chopped black olives and tops hers with sour cream. I omitted both of these ingredients, but you can put them back in if it works for you. I think enchiladas are a great vehicle for leftover lean meats like pulled pork, rotisserie chicken or even roast beef. The Pioneer Woman's recipe made a ton of enchiladas (enough to serve 6 hungry adults). I served mine with Salsa Rice and we had a really good dinner, plus leftovers. 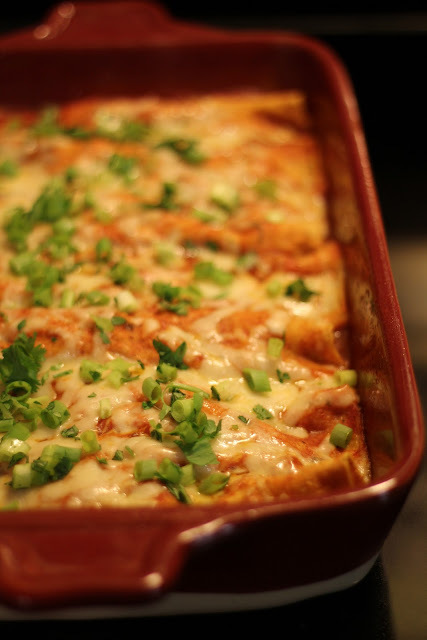 I assure you that these enchiladas are better than many I've eaten in restaurants and they are the best that I've made at home. The filling is flavorful and they have the perfect amount of red sauce. I topped mine with fresh cilantro and green onions and it gave them a nice, fresh finish. Even my onion and pepper-hating husband liked these. These are a bit involved for a weeknight (it took me nearly an hour to get them in the oven), but the leftovers heat up well and that's one of my qualifications for a good weekday meal. Want the original recipe? I pretty much followed this recipe from The Pioneer Woman. There's still time to enter the Emile Henry Giveaway! I swear, P-dub is going to make us both in red meat lovers. I'm usually not a fan of tex mex anything, but I think I want to give these try. And wait, there's a giveaway? I've really got to stop diseappearing for weeks at at time, oy! I love tex-mex and those enchiladas look yummy!